Global climate change has profound effects on biogeochemical cycling in terrestrial ecosystems. 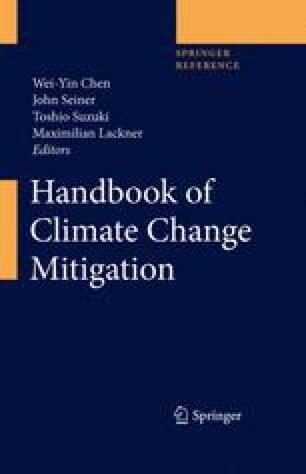 This chapter summarizes the existing state of knowledge on how climate change affects biogeochemical cycling, specifically carbon cycling, as the carbon cycling has long been recognized as important for understanding climate change. The review draws largely on knowledge gained from manipulated experiments, modeling, and meta-analysis studies. This chapter starts with a brief description of current changes in several climate factors such as atmospheric carbon dioxide (CO2) concentration, temperature, precipitation, and ozone (O3) and their effects on terrestrial ecosystems. Then approaches commonly applied in global change research such as natural observation, experiment, ecosystem modeling, and meta-analysis are described. The advantages and disadvantages of these approaches and general procedures are also summarized. The impacts of global change such as elevated CO2, global warming, and changes in precipitation and O3 on carbon cycling in different terrestrial ecosystems are further synthesized. In addition, issues related to global climate change such as single factor versus multiple factor studies, graduate versus step increase experiments, and inverse modeling are briefly discussed. At the end of the chapter, some recommendations for future global change research in terrestrial ecosystems are provided. We thank Dr. Toshio Suzuki for his constructive comments and suggestions that improved the presentation of this chapter. Our work has been supported by grants from the Office of Science (BER), U.S. Department of Energy, grant DE-FG03-99ER62800, and National Science Foundation (DBI0923371 and DBI0933958).